Police officers, paramedics and firefighters lead injured people away from the scene of a powerful gas explosion at a building in the historic center of Prague, Czech Republic, on Monday, April 29. 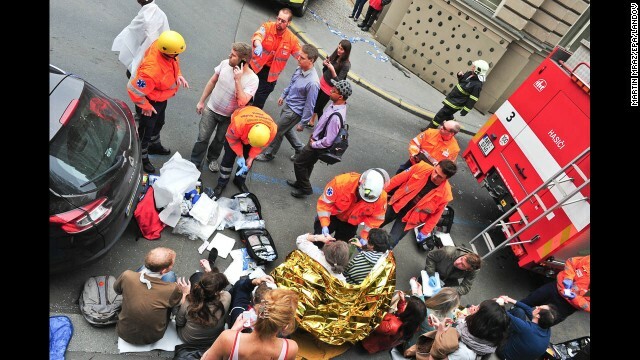 The blast injured at least 35 people. Victims stand on the street near the site of the blast. Crews work at the scene. 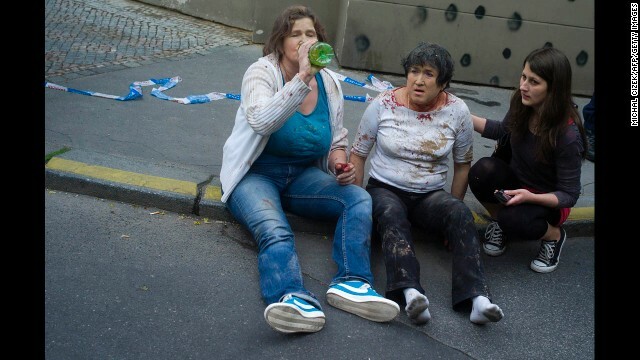 Two women injured in the explosion sit on the sidewalk. Firefighters stand in front of the damaged building. Injured people receive medical care. 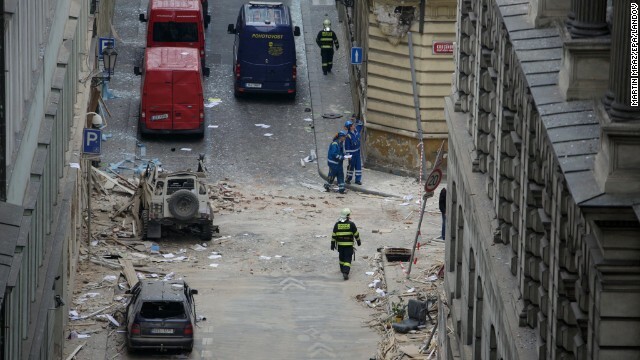 (CNN) -- A gas explosion ripped through a building containing offices and an art gallery in a historic district of central Prague on Monday morning, injuring 35 people and prompting evacuations of nearby buildings in the Czech capital, officials said. More than 230 people were evacuated from the area, including from buildings used by schools including Charles University and the Academy of Performing Arts' film and TV school, known as FAMU, officials said. "We can now confirm this was a gas explosion. 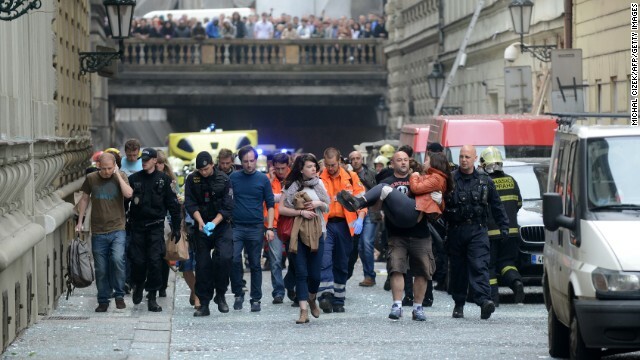 It was not a terrorist attack," Prague Mayor Bohuslav Svoboda told reporters Monday. 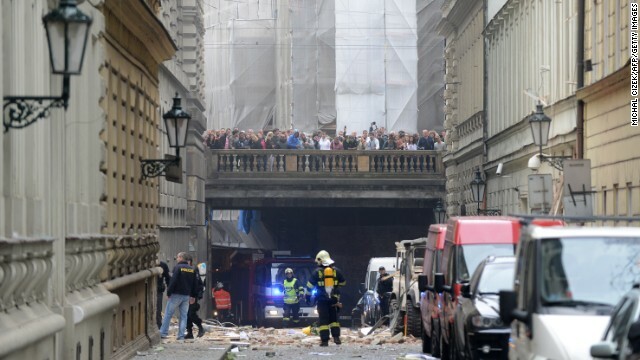 The blast at 5 Divadelni Street, not far from the National Theatre and a block from the Vltava River, which cuts through the city, collapsed the first floor's ceiling, officials said. Windows in neighboring buildings were damaged. Of the 35 people injured, 30 were taken to hospitals, including two people who suffered serious injuries, officials with the city's emergency services said. The city's fire department, which is examining the area for possible gas leaks, said it would take two days to stabilize the site. Charles University canceled classes at an adjacent building for the rest of Monday. A surveyor employed by the city told reporters Monday that the building might not need to be demolished and that the damage appears to be reparable. Earlier, Czech news media gave conflicting reports of the building's location, with an outlet reporting at one point that the blast happened at a FAMU building. FAMU dean Pavel Jech said that the blast happened near FAMU's main building, known as Lazansky Palace, which was evacuated. "Nobody in FAMU has suffered any injuries," Jech said. "There will be no classes for the rest of the week at Lazansky Palace. Classes scheduled at other locations ... will continue as planned. 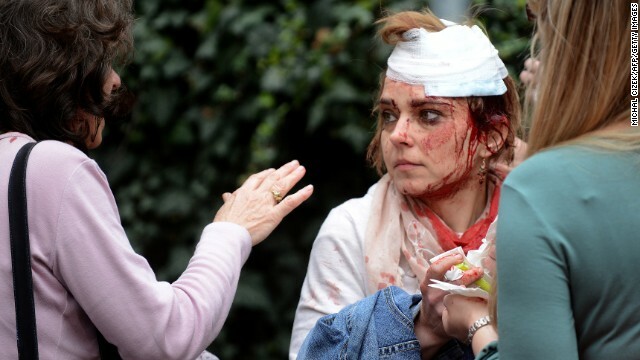 Marianna Zapotilova was in an office in a nearby building when the blast happened. The office's window was open, and the force of the blast "pushed me away from my computer," she said. "There was a lot of dust" immediately after the explosion, Zapotilova said. "People in the area were injured, mainly by broken glass from the windows; they had their heads bandaged." CNN's Sarah Balter contributed to this report.